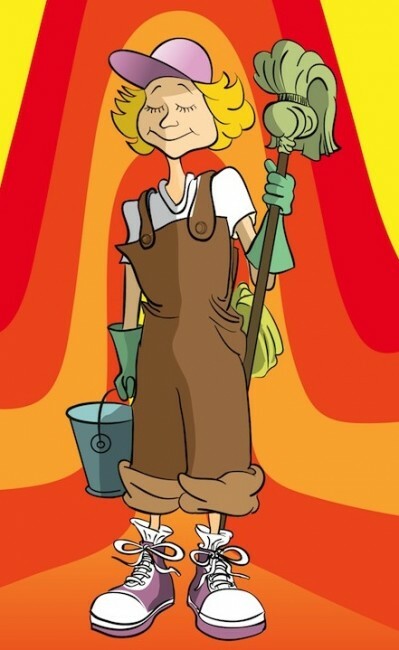 Blog 23 – Ms. McGery, the drama director turned janitor – CPA Theatricals, Inc.
A Job is a job! Ms. McGery was once the drama teacher for Our Lady of Perpetual Chastity Catholic All Girl’s High School. With the loss of funds and being transformed into a charter school, McGery’s position was eliminated, but she was offered in exchange the position of janitor. She reluctantly accepted the position in order to stay close to the students she has grown to love. To bring in extra money, McGery also has also become the adviser for every single extracurricular activity and club, because each brings in a stipend. It’s is rumored her contract calls for her to also do the landscaping. McGery has a flamboyant, theatrical personality, and proudly remembers the days when she ruled the school with her inventive casting and creativity for each year’s musical. People still talk about her GYPSY – with all the Burlesque removed to accommodate the Nuns and her FIDDLER where Tevye was portrayed by a tall red-haired girl with a Southern accent. She aspires to regain her influence and position, and dreams of helping the Math Team put on a show to raise money—even though the team agrees that they would be terrible at performing. Her biggest challenge as janitor is the escape of a pair of ferrets from a meeting of the Pet Club, and she becomes obsessed with finding and capturing the little weasels. At heart, McGery is a soft touch, devoted to her students – a resource and ally to them as they pursue their dreams. She may pretend not to be able to remember names or faces, but she knows and loves her students, and will do anything she can to help them succeed. « Blog 22 – What does an Iceberg have to do with musicals?